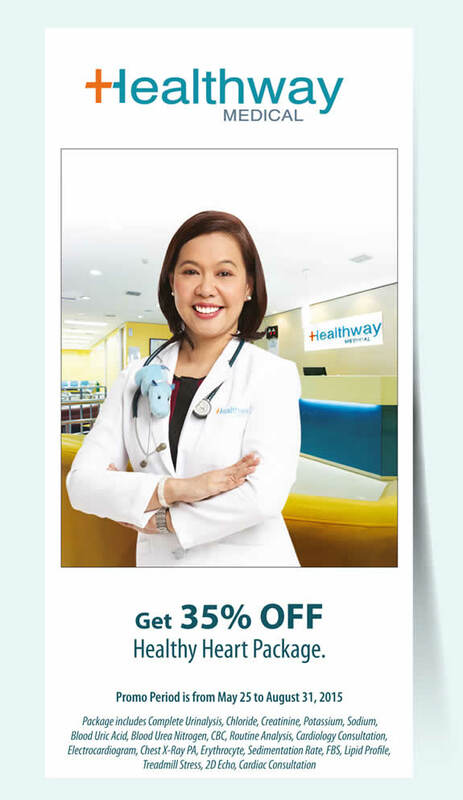 Get 35% OFF the Healthy Heart Package using your Metrobank credit card at Healthway Medical Clinics! Package includes Complete Urinalysis, Chloride, Creatine, Potassium, Sodium, Blood Uric Acid, Blood Urea Nitrogen, CBC, Routine Analysis, Cardiology Consultation, Electrocardiogram, Chest X-Ray PA, Erythrocyte, Sedimentation Rate, FBS, Lipid Profile, Teasmill Stress, 2D Echo, Cardiac Consultation. 1. This promo is open to allMetrobank Peso Visa/MasterCard, Robinsons-Cebu Pacicifc/Go! MasterCard, Platinum MasterCard, and Toyota MasterCard credit cardholders in good credit standing. 2. The promo period is from May 25, 2015 to August 31, 2015. 3. Qualified cardholders can get 35% OFF Healthy Heart package. 4. The Healthy Heart Package is priced at P15,384.61. It can be availed by an MCC cardholder at a discounted price of P10,000. 5. Package includes Complete Urinalysis, Chloride, Creatine, Potassium, Sodium, Blood Uric Acid, Blood Urea Nitrogen, CBC, Routine Analysis, Cardiology Consultation, Electrocardiogram, Chest X-Ray PA, Erythrocyte, Sedimentation Rate, FBS, Lipid Profile, Teasmill Stress, 2D Echo, Cardiac Consultation. 7. Offer is valid from Mondays to Sundays inclusive of holidays. 8. Splitting of transactions is prohibited and shall not be allowed for redemption. Splitting is defined as an intentional act of dividing a retail or merchant installment transaction into multiple charge slips to redeem more than one reward incentive. Presumption of split transactions is having 2 or more transactions in one merchant outlet or establishment over one one and the same product or service, and the interval of these transactions were made within 5-10 minutes. 9. This promo cannot be combined in conjunction with other Healthway promos. In case of claims for Senior Citizen Discount under the Senior Citizens Act, as amended, a claiming senior citizen can avail of the promotional discount or the Senior Citizen Discount, whichever is higher. 10. This promo cannot be combined in conjunction with other Healthway promos. In case of claims for Senior Citizen Discount under the Senior Citizens Act, as amended, a claiming senior citizen can avail of the promotional discount or the Senior Citizen Discount, whichever is higher. For inquiries, call Metrobank Card's 24-hour Customer Service Hotline at 8-700-700 (Metro Manila) or 1-800-1-888-5775 (Domestic Toll-Free).